Since the Guild was founded, it has served C.O.T.S. 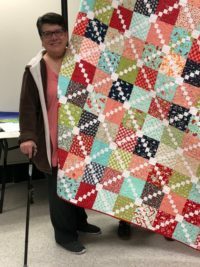 (Committee on the Shelterless) by making quilts for children who are living at the C.O.T.S. shelter in Petaluma. Upon arrival at the shelter, children and adults are allowed to pick a quilt of their choice. This quilt becomes their property and goes with them when they leave the shelter. A constant supply of quilts is needed for new arrivals. Quilting for C.O.T.S. holds work days once every month at Valley Orchards Retirement Community, 2100 E. Washington St., Petaluma. Members are welcome to join the work day or make quilt tops at home. Kits with assorted precut blocks are available at every General Meeting. 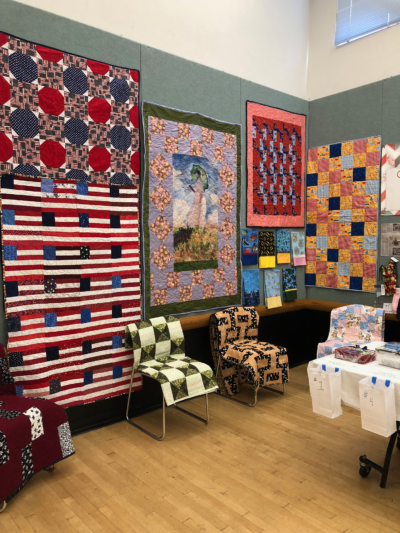 Quilts for Military & Families started as a way for the Petaluma Quilt Guild to reach out to those who are serving our country. Members are encouraged to donate red, white or blue fabric for use in blocks, backing or one of the kits we provide for you. You can also make a block, or blocks or even a whole top from your own fabric. These items will produce tops, which will then be donated to different organizations that facilitate these quilts reaching service members.